Logs are everywhere, networks, servers, containers, cloud infrastructure, IoT, applications, load balancers, everywhere. In order to draw meaningful insights from the sea of logs your administrators, developers, IT operators, and security professionals comb on daily basis, you need a scalable platform that centralizes all these logs. Our SaaS / on-premise centralized IT systems management service provides ability to search and help your devops team find common exceptions, detect patterns in behaviors, and solve SLA, performance issues, and availability problems. Collect and send data from any part of your stack with different log shippers available, and centralize and index logs from operating systems, containers, network devices, AWS infrastructure, application access logs, custom events, and more. Our logging management platform provides ability to create your own queries through its Elasticsearch API as well as rich, yet simple query syntax very much like the query syntax used by Google. Search and analyze your IT enterprise logs using Sematext advanced analytics tools, identify and compare patterns and anomalies, and monitor your whole IT infrastructure through a single pane of glass. You can also create and integrate alerts with commonly used collaboration and messaging software such as Hipchat, Slack, Big Panda, PagerDuty, VictorOps, OpsGenie or simply by using your email address(es). Use these services to continuously monitor large volume of data and logs, and ensure that you are alerted in time. 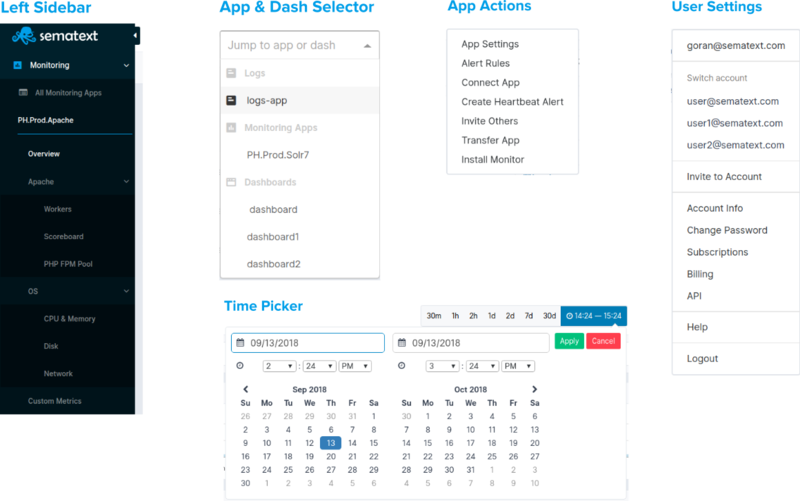 Logs are aggregated by time and shown in the logging management web application, where you have the ability to search for specific terms, narrow down time ranges, filter fields, setup alerts and more. The supported Search API's are URI based search, Request body based search, Real time GET operation, and Multiple GET and Multiple Search operations in a single request. Check related Field Types, Supported Date Formats, Special Fields, and FAQ to learn more about Sematext logging management platform features. Regulatory expectations to store all logs require centralized log management solution, and Sematext logging management platform addresses these requirements. Monitor health of your whole application and infrastructure stack using our Cloud service and ensure that data is properly secured and stored. You can correlate views across multiple logs from different components and get a full stack observability. Share metrics reports and dashboards so that the entire team has access to the same data, while RBAC (Role Based Access Control) provides different access and user permissions to the team. We can help you focus on your core competencies and provide your IT managers with tools necessary for complete logs management together with your stack metrics monitoring, a single pane of glass for full observability. Should security incident or outage take place, you need insight that allows you to quickly resolve the issue and avoid poor customer experience. If you prefer good old way to search and analyze your logs, try our command line tool for viewing, searching, filtering, and analyzing of log entries across all your logs from all your apps. We will keep these requirements in mind while trying to provide insight into Sematext logs section features within our IT enterprise monitoring and logging management suite. This guide will help you get started with our cloud service and discover logs, monitoring, and other application features. Image below shows the default logs view and marked are the main application and system UI elements. Logs Search and Report Menu is where the true power of Sematext APM platform and the whole stack observability comes to life. Events and logs are integrated in a single monitoring reports pane, and used to search server logs, events, alerts, anomalies, and more. Image below shows the report menu in detail followed by explanation on how to use these features. Search logs in a single unified view and add additional components to your metrics reports, share reports, and more. When your app is intially loaded, Save and Reset buttons will be hidden since that is app's default state and there is no need for changes to be saved or reset. If a new component is added or any existing component is edited, alert created, and report component removed, Save and Reset button will appear in the report menu and allow for changes to be saved or reset to the initial state. If your browser is suddenly closed, and no changes were saved or reset, app will preserve the initial state. Save Query - Every query can be saved for later use. Ability to save queries are part of essential tools to search, correlate and investigate logs data. Each saved query becomes the part of saved queries section in our logging platform. Report Actions - Your customized logs report can be better described using meta name and description, and you can assign unique URL Alias to identify that report. Logs Count and Logs Table Component, Line, Area, Bar charts binned by metric creation date, bar chart binned by event creation date, table of events in reverse chronological order, as well as additional logging components that can be added to your logs app are available. Use them together with out of box metrics reports and visualizations, generated when your app is created, and you will go from metric spikes to your apps’ and servers’ logs in seconds and get to the root cause in minutes. Forget about ssh-ing to servers and grepping logs and find similar metric patterns with built-in metric correlations. For Sematext Logging Agent and other Sematext contribution to the open-source community, check our GitHub repositories. or just use chat in the right bottom corner of the app or website page and one of our engineers will help you navigate Sematext waters.